Eleanor Spiteri accompanied Tricia Dawn Williams on her musical journey through film. There is nothing unusual about film music. Some soundtracks have become classics and there seems to be no dearth of composers who are busy in this genre. Some established classical composers like Saint-Saëns (who was the very first) and others like Prokofiev, Gershwin, Shostakovich, Walton, Rota, Glière and Morricone left their mark in various degrees in this rich world of sound. Very often there is a prominent place for the piano and there are always piano reductions of orchestral soundtracks. What was unusual is that Tricia Dawn Williams’s reputation as a pianist mainly rests on her highly successful recitals of contemporary music, not to mention how she has also premiered new works by Ruben Zahra and others. The recital under review here revealed a different side to this pianist. It proved her versatility which seemed easy to achieve, but, probably because of its rarity, it could have been somewhat difficult. However, no trace of that seemed to pervade her playing. Her interpretation of music from a number of familiar films flowed easily from piece to piece, some of which have even become popular numbers independently of the complete soundtracks. Williams managed well in projecting different moods which depended on the context from which they were taken. These pieces would have made even more sense to listeners who had seen the films, but for those who had not, a note provided on the context of each allowed one to relax and let the music take over. The moods were highly contrasting: drama, romance, the epic and even the fantastic surfaced. For example, the song A Thousand Years from Twilight IV – Breaking Dawn (2011) made it seem odd that such a beautiful piece came from a film with such a bizarre plot. 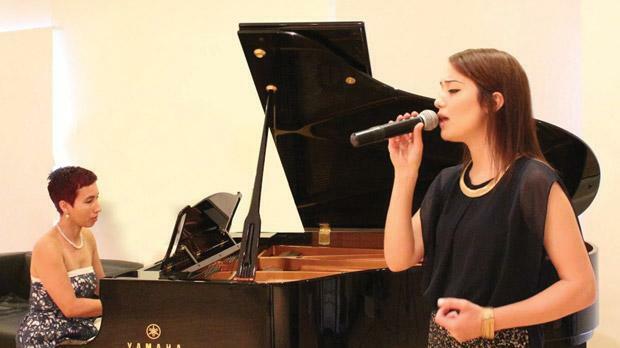 The song was performed by Eleanor Spiteri who has a very pleasant, well-trained voice. She projected it well in all the songs, with generally clear diction and poise. Amplifying her voice was rather superfluous as it would have carried well in the hall. The singer and pianist could have easily found the right acoustic balance. The other songs Spiteri sang were Alan Menken’s Colours of the Wind from Pocahontas (1995), Diane Warren’s warm There You’ll Be from Pearl Harbor (2001) and the surreal Let it Go from Robert Lopez and Kirsten Andersen-Lopez’s Frozen (2013). The opening piano solos were The Poet Acts and The Hours from The Hours (2001) by the renowned Philip Glass, with Briony and Love Letters from Dario Marianelli’s music to Atonement, a lot of which is poignant and replete with regret. The only section with three numbers from the same film, The Piano (1993), featured Big My Secret, Deep Sleep Playing and The Heart Asks Pleasure First, all deeply haunting pieces by Michael Nyman. Very interesting too – as it was in a style not usually associated with Ruben Zahra – was his Simshar from the homonymous and very recent Maltese film released earlier this year. The last piano piece on the programme was Clive Mansell’s very haunting Lux Aeterna from Requiem for a Dream (2000). But after the last song, A Thousand Years, Williams gave an encore for solo piano.